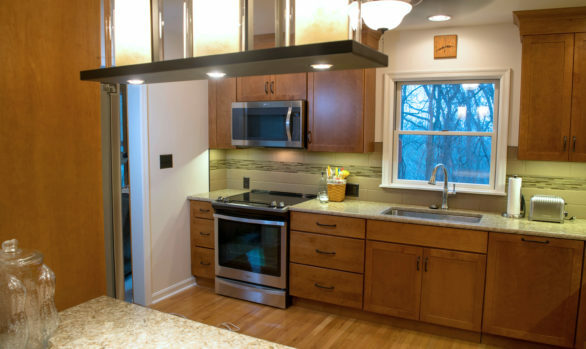 To add personality and function to this space, the homeowners sought out the assistance of the Harrisburg Kitchen and Bath design and build team. The main objective of this project was out with the old and in with more style and storage. Replacing the cabinetry paved the way for the storage opportunities the homeowners desired, including a pull-out trash can between the rectangle sinks and a wall cabinet on the new quartz countertop to house electric for toothbrushes. The Duraceramic flooring creates a serene atmosphere, repels dirt for easy cleaning, and is warm and more comfortable underfoot. The accent wall tiles feature a subtle texture and tone that allows it to blend beautifully into the space while still showcasing the homeowners’ artwork. They decided to keep the shower tile, but the HKB team refinished the grout and installed new shower doors. We also recentered the lights over the sinks, added a makeup mirror, and painted the room. The following is a list of the products featured in this master bath.